This long and weathered tusk sits in a display case outside my office. 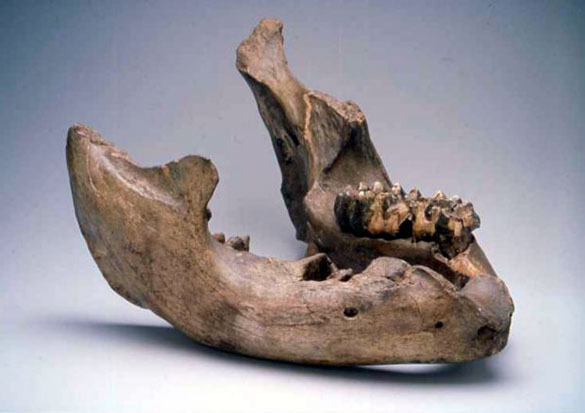 It is from the American Mastodon (Mammut americanum) and was found many decades ago in Holmes County, just south of Wooster. A tooth found with it was a previous Fossil of the Week. Such tusks are rather rare because the ivory tends to disintegrate faster than tooth and bone. Our specimen is, in fact, hollow and held together by wires. 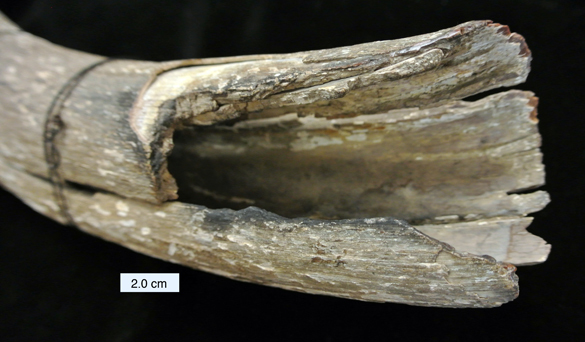 Above is a closer view of the proximal end of the tusk (the part closest to the face). You can see the hollowness and, curiously, that the ivory is charred. I used to tell students that the mastodon must have been hit by lightning, but I stopped when they took me too seriously! 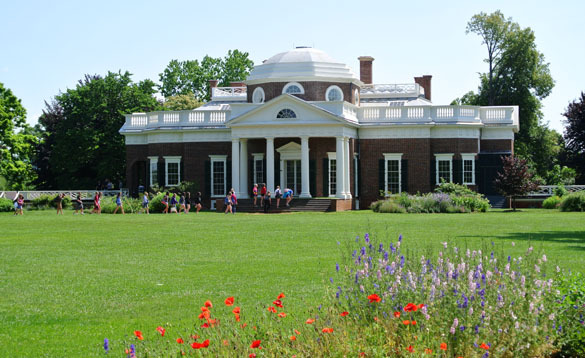 Monticello is, of course, the home of Thomas Jefferson, a Founding Father and the third president of the United States. Jefferson was a science enthusiast, and paleontology was one of his passions. He was fascinated with ancient life, and some have considered him the first American paleontologist. One room of the White House, for example, appears to have been devoted to his fossil bone collection. Mastodons were particularly interesting to Jefferson because of an odd idea that was in vogue in France at the time. Georges-Louis Leclerc, Comte de Buffon, a famous French naturalist, wrote that “a niggardly sky and an unprolific land” caused life in the New World to be weak, small and degenerate. Life in North America was considered by the French to be quite inferior to that in Europe. Jefferson knew, of course, this was nuts. Having the bones of a North American elephant, as large or larger than any other elephants, would show the Frenchies how wrong they were. And Buffon eventually agreed, although he died before he could correct his books. Above is a lower jawbone of Mammut americanum in Monticello. I wish I could have taken my own photograph, but this was not allowed. I’ve had to make do with one of their images online. Curiously, Jefferson had one serious deficit when it comes to calling him a paleontologist. He apparently did not believe that species ever go extinct. When he dispatched Lewis and Clark on their expedition, for example, he expected them to find living mastodons deep in the American interior. Too bad they didn’t! Conniff, R. 2010. Mammoths and Mastodons: All American Monsters. Smithsonian Magazine, April 2010. Semonin, P. 2000. American Monster: How the Nation’s First Prehistoric Creature Became a Symbol of National Identity. New York University Press, New York, 502 pages. Thomson, K.S. 2008. 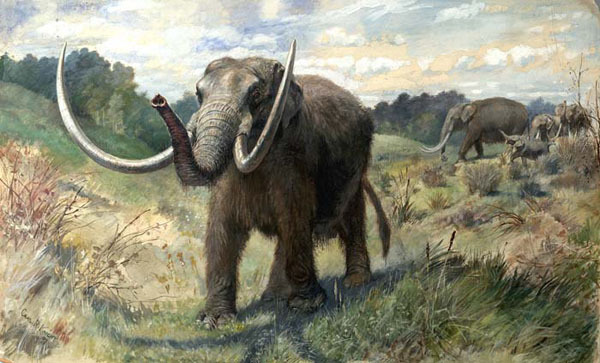 The Legacy of the Mastodon: the Golden Age of Fossils in America. New Haven, Connecticut, Yale University Press.